The title Kentucky Colonel dates back to around 1813. The Kentucky Militia had just returned from a highly successful campaign during the War of 1812. When the Militia disbanded, Governor Issac Shelby commissioned Charles S. Todd, one of his officers in the campaign, as an Aide-de-Camp on the governor’s staff. Todd’s official rank and grade was Colonel. While early Colonels actually served military roles, the position took on a more ceremonial function in the late 1800’s. Colonels in uniform attended functions at the Governor’s mansion stood as symbolic guards at state events and the like. In the late 1920’s, a group of Colonels started talking about forming a “society.” Governor Flem Sampson gave his blessings to the project and late one Saturday afternoon in May of 1931, the first meeting of what would eventually become the Kentucky Colonels was held in Frankfort. “Formulate a society to more closely band together this group into a great non-political brotherhood for the advancement of Kentucky and Kentuckians,” Governor Sampson challenged. And they did. Minutes of the early meetings confirm that charitable programs were to be a central part of the organization. Social events would also play an important role. The group held a Derby Eve dinner for the first time in 1932. Ruby Laffoon, who seemed to have had an innate sense of public relations and an affinity for Hollywood stars, replaced Sampson as Governor in 1932. Early on, Laffoon didn’t seem to take to the idea of a Kentucky Colonels’ society and somewhat shunned the organization, which then was known as The Kentucky Colonels. In December of 1932, Laffoon met with Colonel Anna Bell Ward Olson who owned several movie theaters across Kentucky. 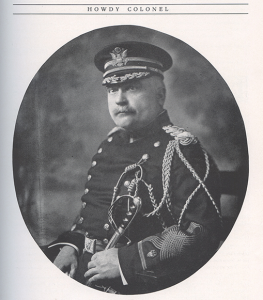 A representative of theater owners nationwide, who also held a Kentucky Colonel commission, accompanied Colonel Olson. The meeting theoretically concerned movie censorship. However, what came out of the meeting was Laffoon’s commitment to Kentucky Colonels and in particular a “new” organization to be called the Kentucky Colonels. Laffoon appointed Colonel Olson as Secretary and Keeper of the Great Seal. Colonel Olson attacked her new position with fervor. Colonels around the world were contacted and invited to become members of the Kentucky Colonels. Social events were scheduled to coincide with the Kentucky Derby to attract as many individuals as possible. At the same time, Governor Laffoon started appointing Colonels with a similar zeal. 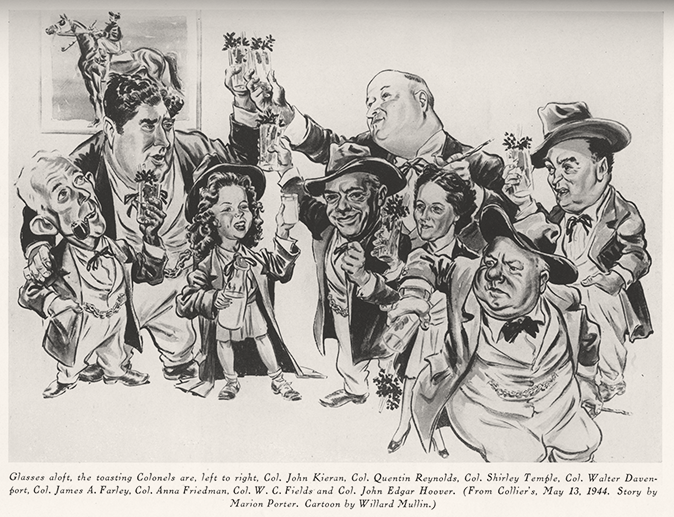 Hollywood personalities such as Mae West, Bing Crosby, Fred Astaire and W.C. Fields not only became Colonels but also embraced the idea of the Kentucky Colonels. The crisis that motivated the Order to make a major impact on the state came with the disastrous Great Flood of 1937. The Kentucky Colonels appointed by Sampson and Laffoon, and organized by Colonel Olson, went to work. New York based Colonels collected five dollars from each member (the equivalent of nearly $100 today). In California, Colonels such as Fred Astaire held benefits to raise money for Kentucky. Recovery from the flood was still on going as the war in Europe broke out. As WWII loomed at the change of the decade, the “great non-political brotherhood” was again mobilized. Colonel Anna Friedman had taken over the duties of Keeper of the Great Seal from Colonel Olson. It was a job that fit her perfectly. Not even Governor Laffoon enjoyed associating with the stars and the elite business community of New York as much as Colonel Anna did. As the country prepared for war, Colonel Anna again used funds donated by these honorary “Kentuckians” to set up recreation rooms for soldiers in training at Fort Knox. By one count, Kentucky Colonels established and then posted signs in at least 35 facilities. The signs read, “Kentucky Colonels hope you hang out and have fun here.” Kentucky Colonels also set up and staffed the WAC recruiting office in Louisville. Kentucky Colonel social events were cancelled during the war. However, a small group of Colonels gathered annually at The Forest, Colonel Anna’s Anchorage home, to drink a toast to the men and women in the service. 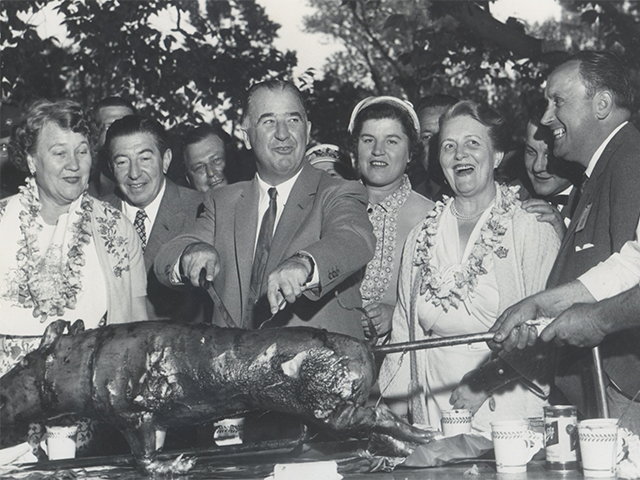 It was, incidentally, at The Forest that the grand tradition of the Kentucky Colonels’ BBQ Reunion began in the late 1930’s. The years following the war saw the charitable side of the Kentucky Colonels grow rapidly. In 1946, Colonels attending the annual Derby Eve Colonels banquet pledged money to help start the Kentucky “Country Doctors” fund. Today, the fund is known more politically correct as the “Rural Kentucky Medical Scholarship Fund.” It has helped hundreds of physicians attend medical school in return for a promise to practice in rural areas of the state. Kentucky’s first cancer treatment center and the Lions Eye Research Center also continue to serve Kentucky. Kentucky Colonels funded both in large part. Colonels continue to contribute dollars to the goal of benefiting Kentucky and Kentuckians. Since 1951, as an IRS recognized 501 (c) (3) charity, the Kentucky Colonels has distributed over 7,000 grants to charitable and educational agencies all across Kentucky. For the last dozen years, the Kentucky Colonels’ Board of Trustees has distributed approximately 2 million dollars each year impacting the lives for more than 3.8 million people in and around Kentucky. This year, someone in every county in the state will be touched by a program funded by the voluntary, tax deductible contributions of Kentucky Colonels living in every state in the nation as well as Colonels living in 49 nations abroad. So, Colonel, the next time you meet a fellow Kentucky Colonel, you can assume you are with a kindred spirit. Someone, like you, who goes that extra step in kindness, goodwill and pride in the Commonwealth of Kentucky.